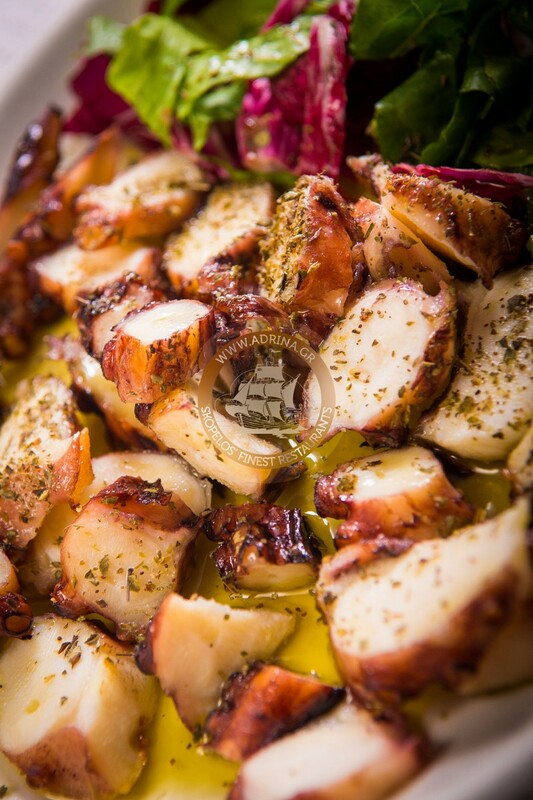 Food in Skopelos is full of delicious gems such as octopus with vinegar. It is a “meze” best enjoyed with ouzo. Octopus is a very nutritious choice, very popular among Greeks. It is a low-calorie lean seafood and a good source of protein without too much fat. Octopus is also a good source of iron, calcium, potassium, phosphorus and selenium while it provides lots of important vitamins such as Vitamin A, B and C as well as some omega 3 fatty acids. Take a look here on how we cook octopus with vinegar. By the end of the recipe you will know why it is such a popular choice of food in Skopelos! First of all, we fill a large casserole with water (high heat) and bring it to boil. We add the octopus and leave it to boil for about one hour while turning the heat to medium. Once ready we place it onto a dish and remove its skin. Next we cut the tentacles and arrange them on a serving plate. Finally we pour some Greek extra virgin olive oil, vinegar and lemon juice. Although full of nutrients, octopus is mostly popular due to its unique and delicious taste. Many European countries’ citizens get to taste it only frozen, but this rarely happens in Greece, since the sea here provides us with plenty of octopuses. Get the chance to explore the unique taste of octopus with vinegar and enjoy another extraordinary choice of food in Skopelos!